Meet Ani Taj: Ani is a choreographer, performer, music-head and the founder of The Dance Cartel. She has choreographed new musicals, plays, concerts, music videos, art parties, flash mobs and more, and she’s currently performing in The Great Comet on Broadway. Ani loves to make dances that remind her of Brazilian Carnaval. We caught up with Ani to discuss the inspiration behind The Dance Cartel, her favorite aspects of performing, and why ONTHEFLOOR is the most exhilarating, sweaty fun you’ll have in Boston this season! Want to join the dance party? Enter the First Access @ OBERON Lottery for a chance to win free tickets to opening night of ONTHEFLOOR on April 27th. Can you tell us about your background and what inspired you to start The Dance Cartel? 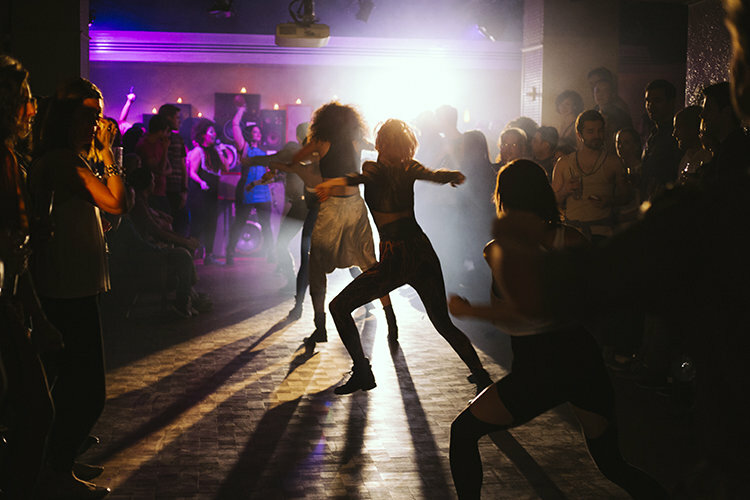 The Dance Cartel was born out of a desire to tap back into the celebratory, joyful, freakish and fun aspects of dance without losing a sense of the rigor and hard work that makes it a gratifying form. We wanted to share this with people from diverse backgrounds, to incite a little spark of movement even in people who typically say “I don’t dance,” or think they don’t know how to read dance. When I was in Brazil, I fell in love with the way dance factored heavily into the lives of people from all walks of life. I wanted to bring some of that spirit into my work in NYC, a city that typically relegates dance to a niche audience (the downtown world, classical ballet or musical theater). I also have a background in musical theater and love seeing music, dance and silliness come together! I turned away from commercial musical theater a while ago because the form started to feel a bit limited and outdated. That’s not always the case, but with TDC I was looking for another way to unite the best elements of musical theater and infuse them with a contemporary sensibility and sonic palate. What is your favorite part of performing with The Dance Cartel? The company is a band of super-talented freaks (a phrase I use lovingly) who share diverse skills and movement styles, highly-developed critical faculties and insight, and a tremendous sense of humor. It is a joy to be around these humans; they remind me that we each have multiple and complex identities and to not shy away from them. They also know how to have a freaking good time. Can you talk about your creative process and what inspired ONTHEFLOOR? Music is a huge inspiration. ONTHEFLOOR started as an exploration of where rhythm lives in the body and how it can be shared across a space. The Brazil connection I mentioned earlier brought a tidal wave of energy; it was a celebration that I wanted to pour into the thing we were making. From there, I gave dancers prompts and probed them for what undeniably made them move, and we kept expanding that into a big party. The dancers continue to teach me a lot about what is fresh and what needs to be addressed in our culture; whatever is on their minds makes its way into the studio. Can you describe ONTHEFLOOR in 3 words? Sweat: Because we do, and we hope you will, too. Gatorade is important. Goofballs: We can’t help it, and when we relax and can laugh at our selves, everything gets a little easier. What kind of theatergoer would love ONTHEFLOOR? We like to believe that ONTHEFLOOR is for everyone. We’ve had diverse crowds—theater kids, entrepreneurs, fellow artists and musicians, danceheads, tech guys, engineers—show up and end up dancing on the floor. Sometimes it takes a moment to loosen up and surrender to the experience, but we really work to make the floor open to everyone, and to welcome you into the Cartel. What excites you about bringing ONTHEFLOOR to Boston? OBERON is such an incredible space for this show! The nooks and crannies around the venue and the encompassing 360 degree feel of the room are so inviting for a show that roves around a space and allows audience to flow with it. We had a great time dipping our toes in the Boston scene in 2015, and we’re excited to get to know the crowd better, feel the young energy from all the local universities, and connect with the theater community that A.R.T. is welcoming us into. We’ve also never been to Boston in the spring and are excited to feel that fever! Can you talk about your involvement with The Great Comet? How has creating and performing with The Dance Cartel informed your experience performing in a Broadway show? The team at The Great Comet gave me space to dance the way I dance, while also emphasizing precision and technique. The musical involves a lot of partner dancing on a narrow runway, so the choreography has to be really precise! We’re also very close to the audience, and we have to convey a feeling of aliveness, respond to audience members in real time, and be ready for any curveballs they may throw you. 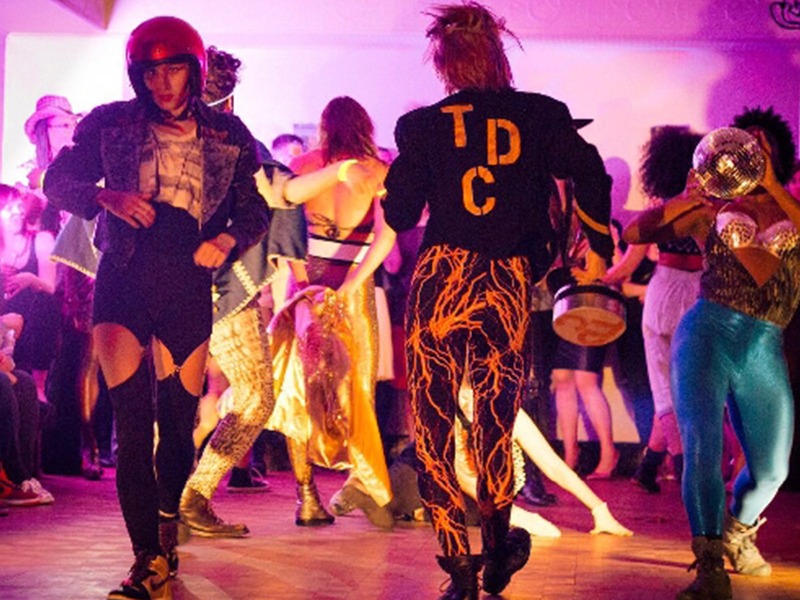 TDC has really prepared me to do this over the years; it’s definitely a bit more raw since we’re literally sweating on a dance floor with you, but both shows truly emphasize contact with the audience in a way that keeps you on your toes and makes the whole room come alive. If this post has inspired you to start dancing around your room/office/line at the grocery store, don’t forget to enter the Lottery for a chance to win free tickets to ONTHEFLOOR on April 27th, where you’ll dance your heart out with Ani and the rest of TDC!